What it All Means to Me! This word or as I see it, “state of grace”, seems to come so easy to some but yet can be so difficult for others, anyone living without respect is depriving themselves of all the gifts that come with it. I grabbed this definition from the internet and there were many but I think this one encompasses the aspects that are a little blurred in society today. It means valuing each other’s points of views. It means being open to being wrong. It means accepting people as they are. It means not dumping on someone because you’re having a bad day. It means being polite and kind always, because being kind to people is not negotiable. It means not dissing people because they’re different to you. It means not gossiping about people or spreading lies. 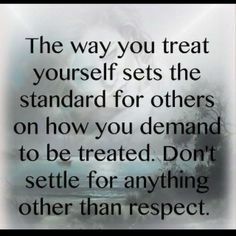 Respect is basic, the unwritten golden rule, and it’s not just about respecting others, there is respect for yourself, life, animals, earth, the environment and many more. When you have basic respect it flows effortlessly into everything you do, it feeds all self-nurturing aspects in yourself and others, like self-worth, pride of accomplishment and a job well done, not just done! Respect lies within every experience and when you live and breathe it daily in your life so much wisdom and personal rewards will be gained. We teach others how to treat us and what we are willing to accept and I haven’t been the greatest at standing my ground when I know I feel lessened and/or weakened in spirit by another. In the past I have allowed others to lower the level of respect I deserve because I felt I was being disrespectful or mean if I said otherwise. I do find that as I learn to further embrace my strength my direction in life becomes more defined and the vision ahead takes a different but stronger and better focused shape. 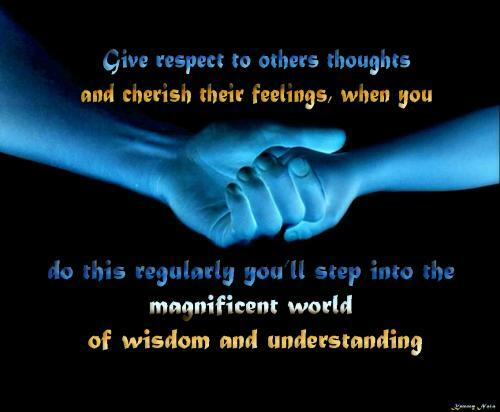 Respect is the cornerstone to all aspects of life, it goes hand in hand with our personal integrity, it is the foundation of all successful relationships and when coupled with gratitude respect and many other states of being are enhanced. If you have gratitude/appreciation for where you are now and the blessings you’ve had in your life you won’t experience as much resistance on your path. Whenever I’ve questioned the Universe as to why a circumstance is so challenging I come across someone who is experiencing it at a deeper level and I am immediately humbled. The Universe speaks to you through your inner spirit, your gut instinct to help guide you to the path you are meant to walk and it is always to your benefit to listen. When you allow your inner spirit and voice to be heard you give yourself the opportunity to share and bond with the Universe and those in it as you were meant to and when you tune into that alignment magical things happen!